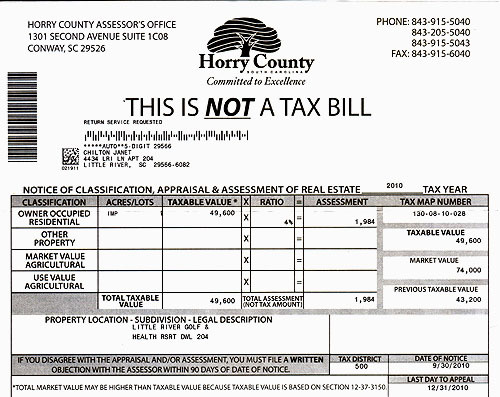 As most of you are aware, Horry County has just completed the property tax re-assessment for all investment and permanent properties. Most of you have received the letter that says in bold..."This is not a Tax Bill". If you have not seen this notice then it is likely sitting in your mailbox right now. It is important that you review this notice so you will know exactly where you stand. I have been getting calls all week from owners like you that are unhappy with the results of the new tax value. To continue C21 The Harrelson Group's commitment of providing valuable real estate information to owners of Myrtle Beach Real Estate, I will address the main concern that I have heard this week. You may have the same concern and this will give you clarity. Or you may have different concerns that I may be able to answer through a direct email. Recent concern..."My property's value has decreased yet my tax value has increased, how does this happen?" First of all, tax re-assessment is not an easy task to complete by the county, due to the amount of properties that they deal with. Unfortunately, it is nearly impossible for the assessor to physically look inside every property nor are they likely to do a single evaluation of your property. This doesn't mean that they are failing at their job...it means that for the most accurate information to be considered, you have to be responsible for doing your own research and ask them to reconsider the value. The Assessors Office understands that there will be many owners disputing their new value. In many cases, the dispute will result in a reduction of tax value, saving you money on your tax bill. Of course, there will be times when they deny the dispute and no change is granted. Review the recent sales and market value of your property. Compare it to the re-assessment value. If you see a substantial discrepancy, consider filing an appeal. I can email you the official Appeal paperwork that is required. Besides being a Realtor in Myrtle Beach, I am also a property owner who has to deal with the same issues as you. As always, I am committed to being your Myrtle Beach Real Estate Resource, and I hope that you find this information helpful. I am always happy to speak with a property owner or prospective buyer, and I invite you to email or call me with any questions you have concerning a home or condo on the Grand Strand.